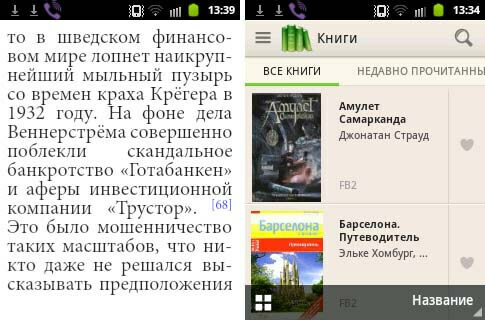 Among modern electronic books even more often appear devices with operating system Android, which enables to install extra apps to reader. More over, this operating system is used in most of smartphones and tabs. 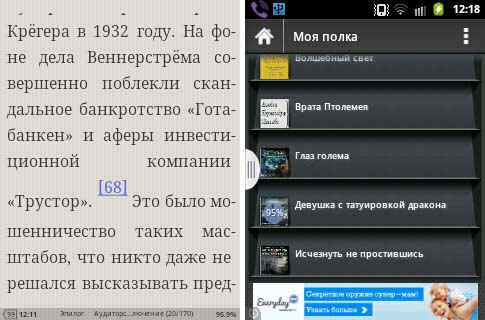 Among thousands of apps, made for Android, there are a lot of programmes for reading. This rewiew was made for users to choose the most suitable programmes for them. One of the main requirements to the programmes for reading is supporting of certain text formats (text formats are described in details in section "Text formats of electronic books"). The second important requirement for such programmes is correct mapping of text (hyphenation in accordance with the rules of your language, convenient display of footnotes, supporting of different styles that are used in the titles, epigraphs, quotations, footnotes, the main text and opportunity to tune them for your covenience(read about parametres of fonts in details in section "Fonts of electonic books"). More than that, it's convenient to have an opportunity to install a book from the network library of the Internet (OPDS catalogues), get the translation or meaning of the word, you can't understand just by tapping the screen (using of dictionaries), it's interesting to use an opportunity of the programme to read aloud (TTS – text to speech). It's convenient when the book in your device's library isn' t shown just like a list of files, but like "cover - the name of the book - author's surname" (See "Bookshelf" page). The most of abilities for the most popular free programmes for reading are shown in the summary table after which, there is a short description of each programme. Cool Reader is one of the most universal and reliable apps for reading for Android devices. The programme has a lot of flexible settings of fonts, interface and management, it is described in details in article "Setting of Cool Reader"
Of all formats we know this programme doesn't open only DJVU and PDF. Interface and "a book shelf" are thought very well, you have an opportunity to download books from OPDS catalogues or from folders in your phone. Also there is realised an opportunity to read aloud, the footnotes are shown at the bottom of the page, like in a paper book. There are 9 tap zones of the screen, tapping of each of them can be flexible set for any function (Scrolling, opening files, jump to chapters, menu display, and so on) It's possible to manage brightness of screen's lightning by swiping your finger along the left side of screen. Fbreader is one of the first programmes for reading, which at first was made for Linux. As Cool Reader this programme can work with OPDS catalogues or files in the device, but there're much less settings of interface. A book shelf shows titles of books and author's surnames, but not covers of books. Also there're no footnotes at the bottom of the screen. Moon+ Reader is newer programme than Fbreader. It's interface is moore thought, there're flexible settings of tap zones of the screen, managing of lightning, opportunity of reading aloud and showing of book's covers. But there're also some disadvantages. First, in free version there're advertisments, which irritate when the book shelf is shown. Then, you can't download your own fonts or footnotes at the bottom of the page. 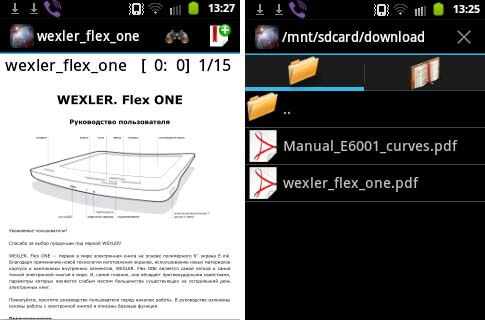 Alreader is long known programme, which was also well recomended among users of Android-devices. This programme has a lot of user's settings, it allows to use your own fonts, shows the footnotes at the bottom of the page, can work with OPDS catalogues. It contains the very interesting styles and realistic surround page turning effect is simply mesmerizing. The only thing it can't do - to show the book's covers, but this trifle is conpensated with other advantages. Aldiko Book Reader is a heavily advertised programme, which occupies one of the first places among the "e-readers" in Google Play Market, disappointed so much that here we give it just to inform. Aldiko works with only two file formats - EPUB and PDF (FB2 is not supported), support for PDF just symbolic, no basic functions necessary for this format, books in EPUB displayed without hyphenation and footnotes. In addition, there is no possibility to flexibly adjust program management, upload your fonts, there is no support OPDS, but there is a possibility to buy books in English in their own online store. Orion Viewer - a specialized program for viewing raster documents PDF and DJVU formats. In it there is everything you need to view documents - managed cropping of fields, different functions scaling and orientation of the screen. Management of the program can be flexibly configured by the user. Most owners of NOOK SIMPLE TOUCH and NOOK GLOWLIGHT prefer this program to native software. Pocketbook Reader is a new development of the Ukrainian company PocketBook. This is an attempt to make one universal program to read almost any format. 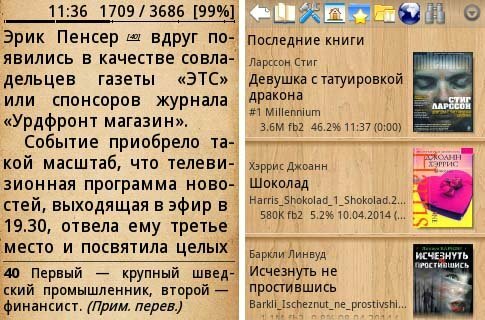 Pocketbook Reader has a very beautiful interface, many settings, 3D-page turning effect is greatly realised, bookshelf shows all the necessary information about the books. However, the program (possibly at the expense of flexibility) is too cumbersome and works quite slowly. When you try to download the table of contents through the last chapter of the book you have to wait about twenty seconds. Still, we recommend paying attention to this program.